Woolff Gallery, London, presents a dynamic new series of paintings by artist Oona Hassim. Her solo exhibition will open on 26 January, 2012, ending March, 15, 2012. Her unique style of painting lies between figurative and abstract. Her works reflect the city’s atmosphere, from benign marches to reactive demonstrations, harnessing the power of mass movement and the mood of its people. Focusing on random crowds and the passage of life that traverses the city of London, her distinctive palette of soft grays juxtaposed against colorful crowds and neon lights. The potent emblem of a city is its crowds. Her new works explore an explosion of recent activity and unrest on the streets. Posing as the flaneur, the impartial spectator, allows Hassim to observe the vast charge of changing energy within the urban environment. 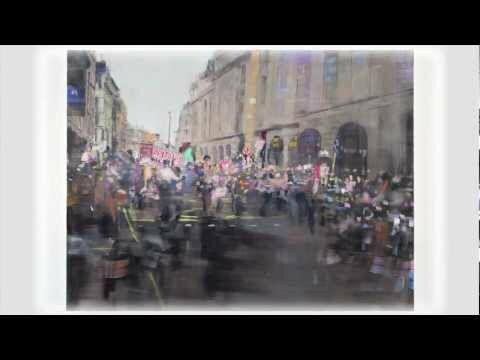 One of her recent works, explore the power of crowds at public demonstrations such as the March 2011 protest rally against the coalition government’s cuts within the public sector. Here she examines the UK’s largest union-organised march since the Second World War, reflecting upon the manner in which passionate crowds can never move freely due to the constraint of the city landscape and event marshaling. In contrast, Hassim’s expression of April’s 2011 Royal Wedding, portrays regimented patriot colours of an ordered, exuberant, yet controlled city. Oona Hassim records these historic events in the traditional and timeless medium of oils – the result is both tempestuous and emotive. As one of the contemporary artists who continues to express concern about the city as a paradigm for society, Oona Hassim depicts its paradox of positive and negative energies and comments. Perhaps to fully understand the city, we need to grasp at all of its trajectories, its intimate corners and blinding glitter, and somehow attempt to weave together these disparate qualities. Here’s also a short film made at Occupy London by the Woolff Gallery.